A few kilometres from the worldly Porto Cervo, Romazzino Hotel boasts one of the most beautiful beaches in the area; you can easily describe it as a little peaceful oasis overlooking the clear blue sea. Particular attention is given to families with children, thanks to the organization of the Mini Club and of its multilingual staff, which offers a wide range of high quality services for children. The childcare of Romazzino Hotel is among the best in Sardinia. Costa Smeralda, the famous tourist location in northern Sardinia, has its heart in Porto Cervo: here, during the hot summer days, you can choose between go shopping in the several boutiques of the most important fashion designers, or enjoy the beauty of the golden beaches and just relax, waiting for the evening appointment in one of the several lounge bars or in the famous Piazzetta. Romazzino Hotel, with its white building, has been projected in typical Mediterranean style. A beautiful flower garden, which ravishes the senses with the intoxicating perfumes of Mediterranean maquis, will take you to the white beach, located just opposite the Hotel. The sea with its characteristic emerald colour is ideal for a relaxing bath and for diving and water sports lovers. 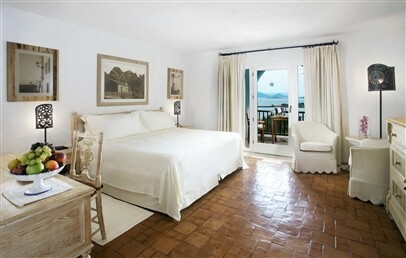 In total the Hotel Romazzino have 100 elegant accommodations divided in 94 rooms and suites plus 6 Villas. 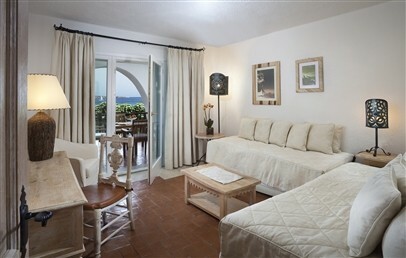 All have either a private balcony or terrace with garden or sea view and are decorated in the typical Sardinian. 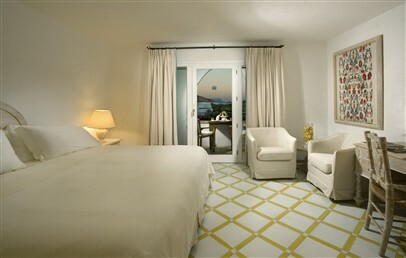 The double rooms are the Classic, Superior and Premium with an average of 26 sq.m. 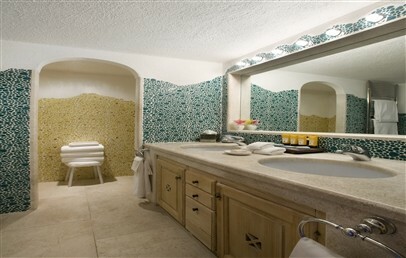 surface, white painted walls and a bathroom with shower with extra big rain shower head combined tub. All have a flat screen television, TV with flat screen, CD and DVD-Player, mini bar, safe and Wi-Fi connection. The suites are the Deluxe Suite (open-plan Junior Suite), Premium Suite (one-bedroom Suite), Royal Suite e Presidential Suite. To complete a perfect holiday, what's better than a few hours to dedicate to itself. The beauty salon and hairdresser of the Hotel Romazzino offer several kinds of facial and body treatments as well as massages, this surrounded by the splendid setting of the Mediterranean Sea. Romazzino Restaurant is elegant and refined and offers traditional dishes skillfully reworked and enriched by the chef. Meat and sea food plates are carefully combined with a mixture of flavours and fragrances, in order to delight the most demanding palates. Guests can further choose to eat at the Restaurant Barbecue by the beach with a selection of pasta, grilled meat and fish, as well as a wide variety of typical buffet starters. For those who prefer a quick and light solution, the Beach Bar next to the restaurant offers light meals, salads and long drinks. Guests can also experience the Lunch and Dine Around Program. Costa Smeralda, and in particular the private beach of the Hotel Romazzino are the ideal destination for lovers of water sports; guests can choose between several proposals: water skiing, sailing, snorkeling, canoe, and much more! But the white sand beach it is also suitable for those who want to relax and enjoy the warm summer sun and the beautiful emerald green sea: well equipped, it is always ready to meet guest’s needs. A few steps from the sea, a saltwater pool is the perfect alternative to the beach. For those who want to keep fit, the fitness centre is available in two different ways: indoors or outdoors, beside the pool. The nearby Pevero Golf Club and Cervo Tennis Club are also available for guests. Guests can’t miss a relaxing walk through the boutiques of Romazzino Hotel and Porto Cervo, the most important nightlife meeting point. 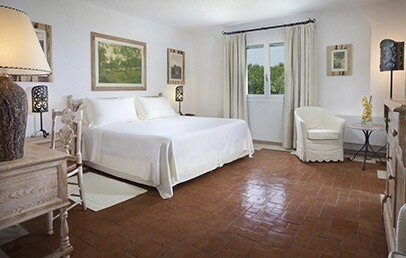 Double bed recently refurbished in Sardinian style and characterized by wooden furniture and craft fabrics. The prevailing colors are warm earth tones and shades of blue and ivory. The private bathroom, decorated with typical tiles and local wood, is equipped with a separate shower tub, hairdryer, bathrobes, courtesy set and telephone. 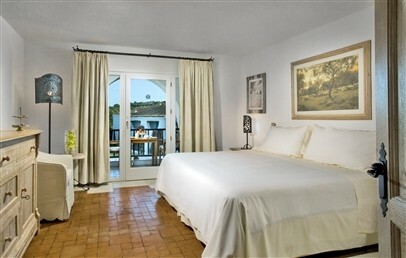 The Superior room overlooks a terrace and has a lovely garden view. 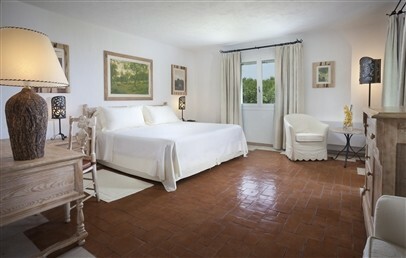 Bright double room for single use, recently refurbished in Sardinian style and characterized by wooden furniture and craft fabrics. The prevailing colors are warm earth tones and shades of blue and ivory. The private bathroom, decorated with typical tiles and local wood, is equipped with a separate shower tub, hairdryer, bathrobes, courtesy set and telephone. 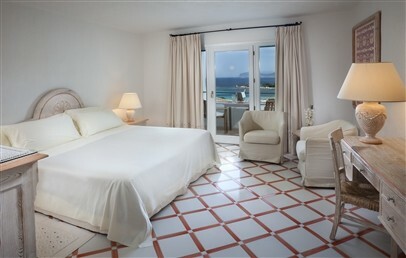 The Premium room overlooks a terrace and has a lovely sea view. Wide open space suite, recently refurbished and equipped with all the amenities. 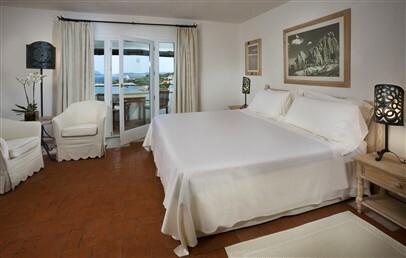 It consists of a large double room with a cozy living room.It is furnished in Sardinian style and characterized by wooden furniture and craft fabrics. The prevailing colors are warm earth tones and shades of blue and ivory. 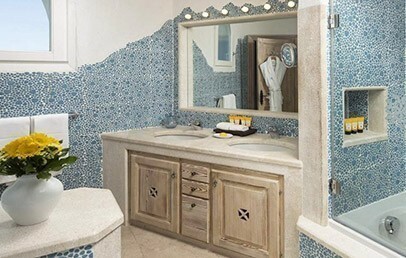 The 2 private bathrooms, decorated with typical tiles and local wood, are equipped with a separate shower tub, hairdryer, bathrobes, courtesy set and telephones. The Premium Suite overlooks a terrace and has a lovely garden view. Wide open space suite, recently refurbished and equipped with all the amenities. It consists of a large double room with a cozy living room. It is furnished in Sardinian style and characterized by wooden furniture and craft fabrics. The prevailing colors are warm earth tones and shades of blue and ivory. 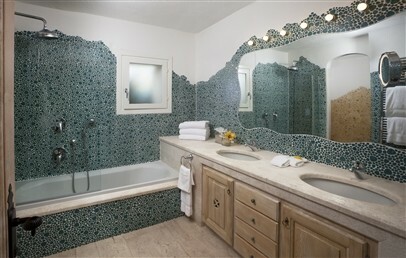 The private bathroom, decorated with typical tiles and local wood, is equipped with a separate shower tub, hairdryer, bathrobes, courtesy set and telephone. 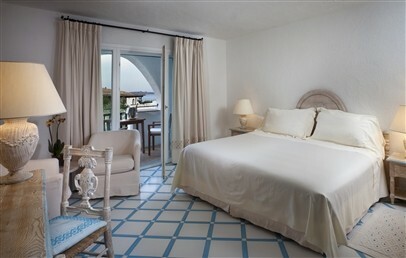 The Deluxe Suite overlooks a terrace and has a lovely garden or sea view.